Rotarians are often accused of not joining together to make a bigger impact. This is clearly not the case with the Medway clubs. 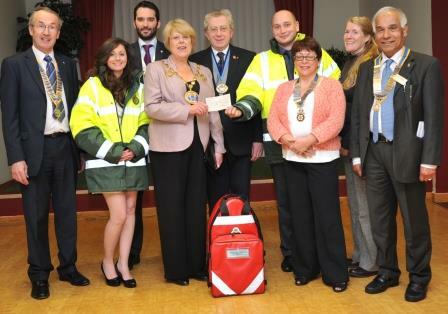 Five Presidents from, Rochester, Strood, Medway, Medway Sunlight, and Chatham clubs all stepped up to the mark with Medway Mayor councillor Josie Iles and her consort, Steve, to present a worthwhile cheque of £1,675 to the local group of ‘First Responders’. These are volunteers, both men and women, aged over 18, who respond to 999 calls as community volunteers. They must be prepared to ‘drop everything’ should the call arise. The funding is part of a Medway-wide project to fund three new units of the responders to fill gaps in the emergency cover in Medway over the next three years. You have to be fit, and over 18, and to be reliable and trustworthy, good under pressure, able to remain calm in emergencies, and to be caring when dealing with patients.Think that sounds like you? You can apply to: recruitment@secamb.nhs.uk – Go for it! 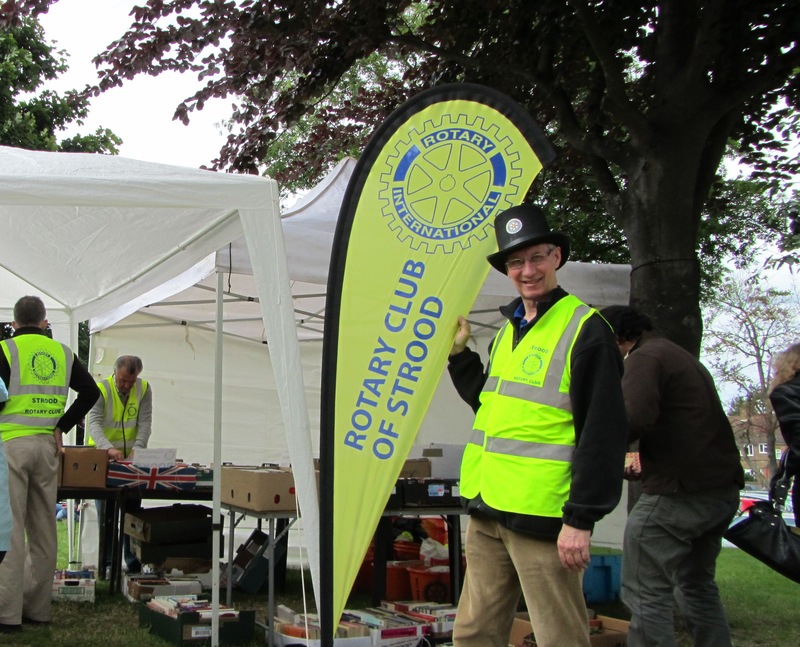 The Rotary Club of Strood was fund raising in-style at the Rochester Dickens Festival 2012. A smart stand, brand new signage/flag and a warmwelcome from the members were sure to attract visitors to buy from a wide variety of books that were offered for sale at the stand. The Rotary Clubs of Medway participted in Remembrance Sunday on 13 November 2011. The service took place at Rochester Cathedral. The laying of wreaths took place at the War Memorial near Rochester Cathedral overlooking the high street. Presidents of Rotary Club of Chatham, Rotary Club of Rochester and Rotary Club of Strood are filmed laying the wreaths on behalf of their Rotary Clubs.